Despite claims and popular assumptions surrounding police regionalization, the studies reviewed demonstrated that large regional police services are not particularly more effective or efficient than medium-sized non-regional services. The primary reason is that policing seems to be a very local issue. In addition, there is evidence to suggest that medium sized police services (those policing about 50,000 inhabitants) are more successful in dealing with crime and operational costs than much larger regional services due to diseconomies of scale. One reason why larger services may be less effective or efficient is that the percentage of officers assigned to patrol decreases as police service size increases. Larger services are more likely to assign personnel to other specialized services such as criminal investigation, traffic control, juvenile services, administration, training, detention, communications, supervisory roles, or crime labs. Research on police service life-cycles has also shown that small police services, usually deploying fewer than ten officers, are more apt to fail due to their inability to maintain or meet ever-increasing policing standards. Thus, the amalgamation of micro-sized police services into larger medium-sized regional entities may be a valid strategy for the future direction of policing in Canada. First Nation police services funded by the First Nations Policing Program (FNPP) have a distinctive mandate and structure, and play a complex role in policing Aboriginal communities. They are also part of a larger Canadian policing environment – one that is evolving in ways that may have strong implications for Aboriginal police services. Currently, Canadian policing is in a period of transition, due in large part to a global trend toward the adoption of private-sector managerial and organizational values and strategies, which are expected to provide greater fiscal accountability, cost-efficiency, and value for money (Murphy, 2007). These initiatives have resulted in an array of service models for policing in Canada, ranging from private and community policing to tiered public policing, as well as the amalgamation of small police services into larger regional police services. Of special interest is the challenge for provinces and territories of providing 24/7 coverage and ensuring adequate response times to calls for service for remote and isolated Aboriginal communities which, on average, have approximately 3,000 residents and are usually policed by micro-sized police detachments of about nine officers (Public Safety Canada, 2014). Research on police service life cycles has shown that small police services, usually deploying fewer than ten officers, are more apt to fail due to their inability to maintain or meet ever-increasing policing standards (King, 2009). There is little publicly available evidence-based research on the amalgamation of police services in Canada. This is despite the fact that over the last 40 years numerous small and medium-sized police services in Canada (especially in Ontario and Quebec) have been amalgamated into larger regional police services (McDavid, 2002; Lithopoulos & Rigakos, 2005). The trend toward the consolidation of smaller police services into regional police services in Canada is similar to what is occurring in the United States and the United Kingdom (King, 2009). Over the last 40 years, regionalized policing has become a priority for provincial governments seeking to transfer the costs of provincial policing to newly legislated regions and municipalities. In Quebec, for example, the provincial government amended the Quebec Police Act (2000) wherein municipalities with populations less than 50,000 had to contract for policing with the Sûreté du Québec (SQ). The rest of municipal police services that were unable to meet the new provincial policing standards were disbanded and consolidated into larger ones. Since 2001, the number of municipal police services in Quebec has shrunk from about 109 to 30 as of November 15, 2012 (Sécurité publique Québec, 2014). This represents a 72% reduction in municipal police services in Quebec over a 10-year period. In Ontario, from 1962 to 1996, 153 police services were amalgamated by the provincial government into 11 regional police services providing policing to over 60 per cent of Ontario's population (CCJS, 1998). The regionalization trend was accelerated in the 1990s when the provincial government enacted Bill 105 (Police Services Amendment Act, 1997), introducing “equitable police financing” to the province. The Ontario Provincial Police (OPP) was dramatically affected as they saw their service contracts to municipalities increase exponentially. The OPP had 16 police service contracts in 1988 (Lithopoulos, 1988), but by 2014, that number had risen to 145 contracts with full cost recovery (OPP, 2014). Following the major municipal restructuring that took place after Bill 105, the OPP managed to cut the number of non-contract municipalities it policed from 576 in 1998 to 179 by 2014 (CCJS, 1998: OPP, 2014). The provincial government also made it possible, for the first time, for municipalities to contract more than one service in a given jurisdiction. Bill 59 amended the Police Services Act to allow for hybrid policing arrangements. Again, the main benefactors seem to be the OPP since they were able to contract specialized service support such as emergency dispatch and investigative services on top of any local regional or municipal police patrol already in place. To suggest that all these possible benefits have been realized has been a difficult claim to substantiate empirically. The potential budgetary enticement toward police regionalization is so substantial that it is not surprising there is actually a dearth of empirical analyses assessing its effects (see Fairweather, 1978; Grant, 1992; Oppal & Graham, 1994; Lymburner, 2014). Another consideration here is that most reports on regionalization were produced after amalgamation was à fait accomplis and tended to rationalize rather than critically analyze its impacts (Fairweather, 1978; Ottawa-Carleton, 1996; Strachan, 2000). The problems of police regionalization, however, have not escaped police analysts, local police boards and municipal councils, and the citizenry. It was a common sight in Canada to see pickets and protests outside police transition board meetings as members deliberated between competing bids by law enforcement agencies. In the case of Quinte West, even entertaining bids from private security companies for tertiary policing responsibilities. The fears of local taxpayers in smaller, typically rural, settings is that they will have less say in how their police services are run and would end up with fewer patrol officers in the community. This fear of the loss of local control is reminiscent of a previous revolution and centralization program in policing that took place in the years following the introduction of the first local “bobbies” in the mid-nineteenth century. During the 1840s, rural ratepayers in England complained in much the same way as their London counterparts the preceding decade. In January 1842, 172 of the 240 townships in the quarter sessions of County Durham received petitions from for the removal of the new police. In November 1842, two-thirds of the parishes in Bedfordshire petitioned for the removal of the police whom they condemned as “expensive, if not inefficient” (Emsley, 1991). The major problem was cost and the lack of visibility and availability of the new police. Perhaps one of the more influential and timely assessments of police regionalization was commissioned by the Ontario Police Commission in 1978. This study was a collective comparison of eight regional and eight municipal police forces in Ontario. Although methodologically questionable given its small sample size, the report contended that regional policing was the most economically and operationally viable form of policing and that regional policing was best suited to deal with law enforcement challenges of the future (Fairweather, 1978). In 1978, the province of Ontario had ten regional police forces serving more than 50 percent of the population and 118 municipal forces served the remaining population. Police service organization and the provision of direct services to the public. The statistics presented in the report, on a per capita basis, indicated that overall police costs were 16.7 percent less in regional than in non-regional police services. Regional services and non-regional services, however, showed few differences in coverage (see definition above) and clearance rates. In a Government of British Columbia (1990) inquiry into policing services, police executives and other experts had a broad consensus in favor of regionalization of police services. This consensus was again based on the belief that police services could be more effective and cost efficient if resources were consolidated and re-organized, and most police chiefs suggested ways to ensure that existing levels of service would be maintained under regionalization (Oppal & Graham, 1994). No empirical evidence, however, was produced to support the view that regional policing was the superior model. In British Columbia, the issue of police amalgamation was resurrected as a viable option in increasing coordination of police homicide investigations in the recommendations of the report of the Commission of Inquiry on Missing Women (Oppal, 2012). Again, no empirical evidence was produced, or study was conducted to support this recommendation. However, this time it faced vigorous and organized opposition from the media, community groups, and many criminal justice professionals (Burgmann, 2013). Grant (1992) conducted a similar study of policing arrangements for the Solicitor General of New Brunswick and recommended the regionalization of police services concomitant to the re-organization and regionalization of local government in that province. According to the author, even if local government was not regionalized, regional policing should nonetheless be introduced by the provincial government as the only means, outside RCMP arrangements, of attaining the necessary policing capabilities. Overseas, Loveday (1990) analyzed the implications of further amalgamations of the smaller provincial police services in England and Wales. His conclusion was that there was evidence to suggest that, on grounds of both efficiency and effectiveness, small police services are actually more successful in dealing with crime and managing operational costs than enlarged regional services. This is because policing essentially remains as local as crime itself, despite an increase in international crime concerns. Moreover, the police are still very dependent on the local public to clear up crime. Indeed, according to Loveday, there is no empirical evidence to demonstrate that police effectiveness substantially improved when police services were amalgamated. Furthermore, there is even some evidence to suggest that increases in organizational size may have a dysfunctional rather than an ameliorative effect on efficiency and effectiveness. For example, there is little evidence to suggest that availability of personnel has increased due to successive amalgamations. In Merseyside, from 1974 to 1984, the number of officers available for duty in each shift, as a percentage of actual force strength, had fallen from 7.1 percent (1974) to 6.1 percent (1984). This indicates that there can be an inverse relationship between the size of the police service and the number of officers available for uniform patrol duties. Loveday stresses that there is a propensity for large police services to use personnel for specialized functions that depletes the number of officers available for uniform patrol duties. Ostrom et al. 's (1978) study of 1,159 police services in the U.S. corroborates Loveday's observations. Their findings discredited the notion that small police services make less efficient use of their employees than large services. Notwithstanding the titles that indicate management responsibilities (e.g. chief, assistant chief, etc. ), many police administrators, especially in small police services are a regular part of the patrol force. Smaller police services have a lower portion of their officers assigned to administration and a higher proportion assigned to patrol. For example, police services with ten or fewer officers assign, on average, more than 90 percent of their officers to patrol. Police services with more than 150 officers, on the other hand, average less than 60 percent of their officers assigned on patrol. In other words, the percentage of officers assigned to patrol decreases as police service size increases. Larger services are more likely to assign personnel to other specialized services such as criminal investigation, traffic control, juvenile services, administration, training, detention, communications, crime labs, etc. It is interesting to note that the major factor cited by both security executives (McLeod, 2002) and analysts for the rise of private policing in urban Canada reflects the diminished visible presence (Shearing, 1997) and higher per capita cost of public policing since the early 1970s (Rigakos, 2000) – not coincidentally occurring during the advance of police amalgamation. Many regionalization proponents stress the need of having all services within the same department to facilitate coordination of separate services. However, Ostrom et al. (1978) in studying 80 metropolitan areas discovered considerable inter-service communication and coordination of services. They stressed that the trend to re-organize all service functions within a single full-service police service is based more on conventional wisdom concerning bureaucratic organization than on empirical evidence. In addition, they stressed that not all divisions of labor in a large bureaucratic organization are effective. Occasionally, there is miscommunication, isolation, non-cooperation, and lack of coordination between various departments in large police services. An extensive survey of policing in Canada by Normandeau and Leighton (1990) concluded that there are arguments on both sides of the issue, but to date, little empirical research exists to provide conclusive evidence regarding the merits of regionalization. The authors also emphasized that the movement towards regionalization strikes the very heart of one of the major trends in policing, that is, the community policing movement. Community policing is a philosophy that promotes organizational strategies that support the systematic use of police-community partnerships and problem-solving techniques to address public safety issues such as crime, social disorder, and fear of crime. Although there is nothing inherently contradictory about community-based policing and the increased use of regional police services, the co-habitation of community policing and regionalization does raise some interesting theoretical and political contradictions. Take, for example, the re-organization and amalgamation of policing in the Ottawa area into one large regional police service in the mid-1990s. At the same time the new Ottawa Police Service was being created, it was adopting a new service delivery model (problem-oriented policing – see Goldstein, 1990) within a strong community-policing framework (Ottawa-Carleton, 1996). There may have been a realization by senior police policy-makers in Ottawa that the regionalization and concomitant centralization of policing services could be a threat to community proactivity and control. Within this context, they addressed this problem by immediately adopting the community-policing service delivery model for the newly created regional police service. Until recently, what was noticeably absent from the peer-reviewed literature was an evaluation of the proposed efficiency and effectiveness effects of police regionalization in Canada. In 2002, James McDavid published an article entitled, “The impacts of amalgamation on police services in the Halifax Regional Municipality,” wherein he analyzed the 1996 amalgamation of the Town of Bedford, the cities of Dartmouth and Halifax, and Halifax County to create the Halifax Regional Municipality. There was also a concomitant amalgamation of their respective police services. To this end, the study compared the costs, resources, service levels, crime rates, workloads and citizen perceptions of police services before and after amalgamation. The findings suggested that, overall, post-amalgamation of police services in the Halifax region was associated with higher costs (in real-dollar terms), lower numbers of sworn officers, lower service levels, no real change in crime rates, and higher workloads for sworn officers. The findings from three citizen surveys that compare perceptions before and after amalgamation indicated that when the comparisons were focused on persons who actually called the police in 1997 and 1999, nearly 32% of those surveyed in 1997 felt that police services had gotten worse since amalgamation, and nearly 25% felt the same way in 1999. In 1995, 39% of survey respondents expected services to get worse with amalgamation. The author claimed the efficiency and cost-effectiveness of amalgamations tended to rest on evidence that is generally inadequate to assess the actual consequences of this kind of organizational change. His study suggested that when predictions were tested, there was a considerable gap between the rhetoric and what actually happened when police services were amalgamated in an urban setting. Lithopoulos and Rigakos (2005), who compared the efficiency and effectiveness of 30 regional versus 30 non-regional police services in Canada, corroborated the findings of the McDavid (2002) study. The study empirically challenged the purported relative effectiveness and efficiency of larger regional police services versus smaller non-regional services in Canada. Methodologically, four measures were used to assess efficiency: per capita cost, cost per Criminal Code offence, number of officers per 100,000 inhabitants, and number of support staff per 100,000 inhabitants. Three measures were used to assess effectiveness: violent crime clearance rate; property crime clearance rate; and total Criminal Code clearance rate. The authors concluded that based on cost efficiency and effectiveness measures regional police services were not more cost efficient than non-regional police services, and regional police services are not more effective than non-regional police services. Per capita cost differences between regional and non-regional police services, although not statistically significant, were important enough to iterate that regional services were $10 per capita cheaper than non-regional services. On the other hand, the non-regional services demonstrated important, albeit not statistically significant, savings in the cost per Criminal Code offence handled, and provided the communities they policed with higher levels of service in terms of the number of officers and support staff employed per 100,000 population. In terms of the effectiveness of large regional police organizations to deal with crime and disorder due to their use of police officers for specialized functions, the results indicate that specialization did not have a significant effect on police effectiveness. In fact, clearance rates for violent and property offences were almost identical between the regional and non-regional services. In the United States, Ostrom (1976a) and Southwick (2005) discovered similar results. Both researchers discovered a curvilinear relationship between police service size, cost-efficiency, and operational effectiveness. Ostrom (1976a) concluded that the consolidation of small police services into a medium-sized police service might indeed increase police effectiveness and cost-efficiency, but not the consolidation of medium-sized police services into larger police services. Southwick (2005) used a simultaneous equations method for estimating police production and demand to determine whether there are economies of scale in policing. The estimation yielded the result that mergers “which are intended to save money should not be done if the resulting community is larger than 50,000 (p. 470).” Southwick also added that very large municipal police services have monopoly pricing power not found in small and medium-sized police services. The analysis in this paper indicates that despite claims and popular assumptions surrounding police regionalization, large regional police services are not demonstrably more effective or efficient than medium-sized non-regional services. The primary reason is that policing seems to be mainly a local issue. In addition, there is good evidence to suggest that medium sized police services (i.e. those policing about 50,000 inhabitants) are more successful in dealing with crime and operational costs than much larger regional services due to diseconomies of scale (Ostrom, 1976a; Ostrom et al., 1978; Southwick, 2005; Lithopoulos & Rigakos, 2005; Found, 2012). One reason why larger services may be less effective or efficient is that the percentage of officers assigned to patrol decreases as police service size increases. Larger services are more likely to assign personnel to other specialized services such as criminal investigation, traffic control, juvenile services, administration, training, detention, communications, supervisory roles, or crime labs. The mechanics of police regionalization seem to undermine the community-policing principles, which entail decentralization on two levels: within police organizations and between the various levels of policing. Community policing requires rank and file police officers to exercise discretion so they can adapt to specific situations and the needs expressed by local citizens (Trojanowicz and Bucqueroux, 1990). Under scrutiny, the other arguments in favor of regionalization, such as the need for specialized services and increased cooperation between jurisdictions appear to be problematic. Other studies, and indeed, provincial practice indicates that small police services are able to obtain specialized services from larger provincial or adjacent police services, as required. In the “real world,” there is already considerable cooperation between services. In addition, small police services tend to have closer contact with the people they police that, in turn, may facilitate their effectiveness and intelligence gathering (Strachan, 2000). This observation supports the community policing strategy. As far as the claim that regional policing is the trend of the future, there has been little empirical evaluation of the underlying assumptions on which it is based. Studies that were conducted supporting this view from the 1970s to the mid-1990s were methodologically limited. Furthermore, many reports were produced after regionalization was à fait accomplis and there was a tendency to rationalize rather than provide empirical evidence on the benefits of regionalization. According to Ostrom and Bish (1976), the recommendations of these reports are much more the product of a “way of thinking” about police effectiveness, i.e. consolidation and integrated command structures headed by competent and professional staff, and a high division of labor, than an empirical analysis of policing issues or police performance metrics. For the First Nations Policing Program (FNPP), there is always the challenge of adequate funding for the provision of 24/7 coverage and ensuring adequate response times for remote and isolated Aboriginal communities. These communities have high victimization rates, about 3,000 residents, and are now policed by about nine officers (Public Safety Canada, 2014a). As noted, research on police service life cycles has shown that small police services, usually deploying fewer than ten officers, are more apt to fail due to their inability to maintain or meet ever-increasing policing standards (King, 2009). To this end, the FNPP might benefit from economies of scale if there were amalgamations of small First Nations self-administered police services into larger medium-sized regional police services. Theoretically, there may be significant cost savings and advances to service quality in exploring such mergers, but there may be significant challenges associated with the amalgamation of these services, if ethnicity, language, culture, and political affiliation vary significantly between communities. Of course, there is dire need for further research in police amalgamation. In particular, the empirical examination of the relationship between police service size and relative efficiency and effectiveness as it pertains to economies of scale. 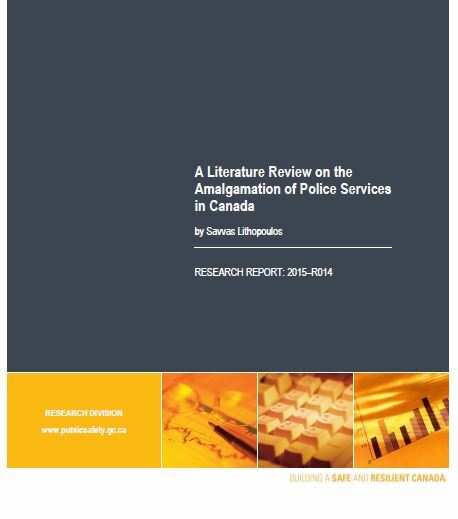 Based on the review of the literature, the amalgamation of micro-sized police services into larger medium-sized regional entities may be a valid strategy for the future direction of policing in Canada, and the First Nations Policing Program and Policy. Emsley, C. (1991). The English Police: A Political and Social History. 2nd ed., London: St Martin's Press. Fairweather, S.C. (1978). Review of Regionalized Policing in Ontario. Toronto: Ontario Police Commission. Goldstein, H. (1990). Problem-Oriented Policing. Philadelphia: Temple University Press. Government of British Columbia (1990). Policing British Columbia in the Year 2001: Report of the Regionalization Study Team. British Columbia Ministry of Solicitor-General, Police Services Branch. Grant, A. (1992). Policing Arrangements in New Brunswick: 2000 and Beyond. Fredericton: Department of the Solicitor-General of New Brunswick. Lithopoulos, S. (1988). “Police Personnel in Canada, 1988.” Juristat Service Bulletin, Vol. 9 No. 3, Canadian Center for Justice Statistics, Statistics Canada (August 1989). Lithopoulos, S. and Rigakos, G. (2005). “Neo-liberalism, community, and police regionalization in Canada. A critical empirical analysis.” Policing: An International Journal of Police Strategies & Management, Vol. 28 No. 2, pp. 337-352. Lithopoulos, S., and Ruddell, R. (2011). “Policing isolated Aboriginal communities: perspectives of Canadian officers.” Policing: An International Journal of Police Strategies and Management, Vol. 34, No. 3, pp. 434-453. Loveday, B. (1990). Road to regionalization. Policing, Vol. 6 No.4, pp. 637-65. Lymburner, M. (2014). “Amalgamate this!” Blue Line. February 2014, Vol. 26 No. 2, p. 5. McDavid, J. C. (2002). “The impacts of amalgamation on police services in the Halifax Regional Municipality.” Canadian Public Administration, 45(4), pp. 538-565. McLeod, R. (2002). Parapolice: A Revolution in the Business of Law Enforcement. Toronto: Boheme Press. Murphy, C. (2007). The Implications of Current Policing Trends for Aboriginal Policing and Policy: Discussion Paper. Ottawa: Public Safety Canada. Normandeau, A. and Leighton, B. (1990). A Vision of the Future of Policing in Canada: Police-Challenge 2000: Background Document. Ottawa: Police and Security Branch, Solicitor General Canada. Oppal, W.T. and Graham, L. (1994). Regionalization of Policing Services in British Columbia: Quality and Equity Issues. Victoria: Policing in British Columbia Commission of Inquiry. Oppal, W. (2012). Forsaken: The Report of the Missing Women Commission of Inquiry. Vancouver: Missing Women Commission of Inquiry. Ostrom, E. and Bish, R.L. (1976). Understanding Urban Government: Metropolitan Reform Reconsidered. Washington, DC: American Enterprise Institute for Public Policy Research. Ostrom, E. (1976a). “Size and Performance in a Federal System.” The Journal of Federalism, The Center for the study of Federalism, spring, 1976, Oxford University Press. Ostrom, E. and Parks, R.B., Whitaker, G.P. (1978). Patterns of Metropolitan Policing. Cambridge, MA: Ballinger Publishing Company. Ottawa-Carleton (1996). Ottawa-Carleton Police Amalgamation Report. Ottawa: Ontario Civilian Commission on Police Services. Public Safety Canada (2012). Economics of policing. Presentation delivered to the ministers responsible for justice and public safety. Charlottetown, PEI: January 25, 2012. Public Safety Canada (2014). Aboriginal policing data provided by the First Nations Policing Program, Public Safety Canada, as of August 27, 2014. Rigakos, G.S. (2000). “The significance of economic trends for the future of police and security, “in Richardson, J. (Ed. ), Police and Security: What the Future Holds, pp.176-9, Ottawa: Canadian Association of Chiefs of Police. Shearing, C.D. (1997). “Unrecognized origins of the new policing: linkages between private and public policing,” in Felson, M., Clarke, R.V. (Eds. ), Business and Crime Prevention, pp.219-30, Monsey, NY: Criminal Justice Press, Monsey. Southwick, L. (2005). “Economies of scale and market power in policing.” Managerial and Decision Economics, Vol. 26, Issue 8, pp. 461-473. Strachan, S. (2000). “Bringing two separate police services together under one chief.” Blue Line: Canada's National Law Enforcement Magazine, February, pp.18-19. Trojanowicz, R., Bucqueroux, B. (1990). Community Policing: A Contemporary Perspective. Cincinnati, OH: Anderson. According to Statistics Canada, the average household in Ontario contains 2.4 residents.